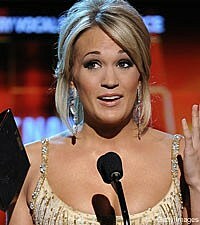 Carrie Underwood has her fourth career Grammy Award, taking home Best Country Female Vocal Performance for 'Last Name.' The honor was given out during the pre-Grammy telecast in Los Angeles Sunday, where Brad Paisley also took home a Grammy for Best Country Male Vocal Performance for 'Letter to Me.' Paisley is also the winner of Best Country Instrumental Performance for 'Cluster Pluck,' with James Burton, Vince Gill, John Jorgenson, Albert Lee and Brent Mason. Robert Plant and Alison Krauss are winners of Best Country Collaboration With Vocals for 'Killing the Blues,' a song from their duets album, 'Raising Sand,' which is up for the night's biggest award, Album of the Year. See the full list of 2009 Grammy winners here.